Home » Traditional » 40" - 49" » Beckham 48"
This bathroom vanity has classic traditional style. With carved decorative scrolling leaf design and carved turned legs, white marble top is a wonderful accompaniment to the finish and the hardware are real eye catcher adding the perfect touch. It is a truly amazing vanity. 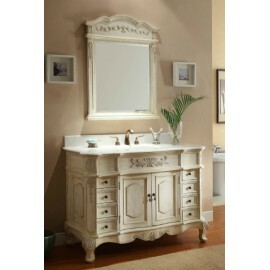 This lovely traditional vanity is the perfect addition to any bathroom decor. Showcase your bath with a vanity that speaks to your exquisite style.